Well it seems my friend of tumble lube groove fame isn't going to make renditions of my BRP/RD 432-375GC and 432-400GC so I suppose I'll have to start deciding on what new molds i want ! Since I have Mt Sourdough's 433-425GC version working to suit me I can step it up to a 450 or 465 grainer with a gas check . Also I'm thinking I need a 360 or 365 grain gas check mold as well for my Retro 444P rifle ! 6pt-sika wrote: Well it seems my friend of tumble lube groove fame isn't going to make renditions of my BRP/RD 432-375GC and 432-400GC so I suppose I'll have to start deciding on what new molds i want ! So that is the word, huh? Bummer, I was thinking that could have led to Lee having a 400gr 444 bullet. That won't happen now. Any hints as to why he isn't interested? Time? I'm not sure to be honest . Our mutual friend "Bruce" in Florida sent me an email . And in it he said he had emailed him to tell him he wanted in if it happenned and Bruce said he got a reply saying he had decided not to do it . That is a shame that he decided to not do it. He would have done a first rate job and been able to standardize 400gr bullets in the 444. We've been doing the DCP deer hunting on a 1250 acre working beef and grain farm for a couple weeks now and have taken 5 whitetails so far ! Popped one with the RD 432-240GC at about 75 yards and as one would expect she didn't go 10 steps after the shot ! This afternoon we started Bear DCP hunting on the same orchard we've been hunting for the last 5 years . I carried my 2001 Marlin 444 loaded with the MM 433-425GC Huckberry ! Sorry to say nothing was seen to send lead at ! Well this evening I went back to the same place I was at Labor Day monday evening ! I was just about ready to start getting down and a deer walked out beneath me and I dusted it with my old Parker GH 16 gauge damascus gun shooting my handloaded shells with 10 of the #1 Buck pellets , Remington SP-16 wad and 21 grains of Unique . At the boom of the gun the deer folded up as I aimed at the base of the head and since it was less then 10 yards from the base of the tree well you get the picture . When I fired I heard another one behind me walking around so I laid the Parker down and picked up my circa 2001 Marlin 444 loaded with the Mountain Molds Mt Sourdough 433-425GC bullet I had cast and pushed with 37 grains of RL-7 . Another one stepped out above me by about 15 yards and I drilled her behind the shoulder . She went 10 yards and fell back in a small ravine ! The Parker and my 2001 Marlin 444 . By the time I got down the tree it was pretty dark and my pics ain't so great . Next trip back in here I'll take my Ithaca NID 10 gauge #3 Buck in the right barrel and 000 buck in the left barrel . And I'll use my MM433-400GC bullet in the 444 ! I hope you enjoy the meat as much as I would. mtngun wrote: I hope you enjoy the meat as much as I would. I cut the tenderloin and back straps off to keep at home . The rest u cut off the bone for my buddy . He'll grind it into burger and we'll eat it at the shop for lunch ! He and u started hunting in mid July and so far between us we've gotten 11 deer and a bear . Still have 3 more weeks . Wow 6pt. That's a lot of critters. In Arizona, a guy's gotta feel lucky to get one deer tag a year. I am preparing for a Coues deer hunt for a week at the end of October. That is the length of the season, one week! I am going to use my '65 444. I have been doing load work for the '65 with my MM 237gr Sage Country II bullet. I have been on a roller coaster ride with it, but I have things ironed out now. I am pushing the 237gr bullet about 2550fps. Last week, I received a new MM mold in the mail. The 187gr Chino Valley bullet is now a reality, but I wont be able to do any serious load development with it until after my Coues deer hunt. I did take a little peek at velocities using AA1680. This was with 58gr AA1680. 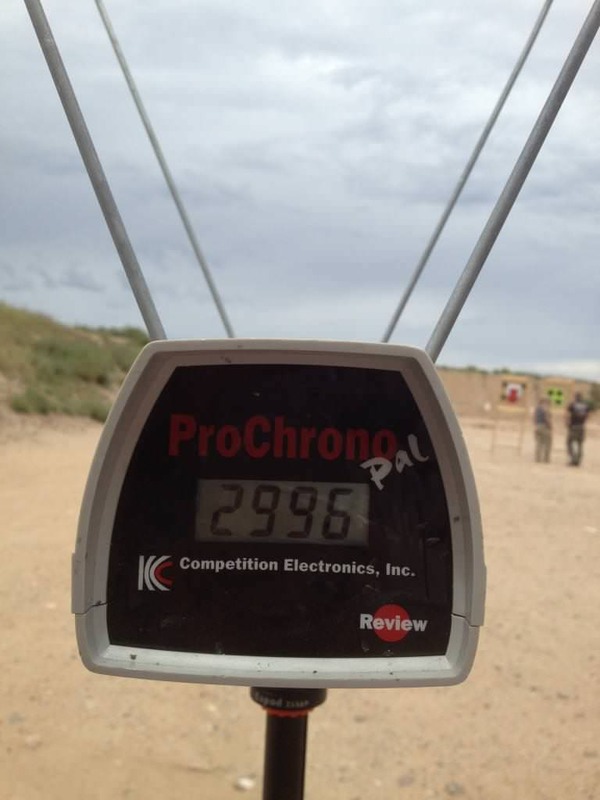 After 5 shots of shooting the Chino Valley around this velocity range, there was zero leading. 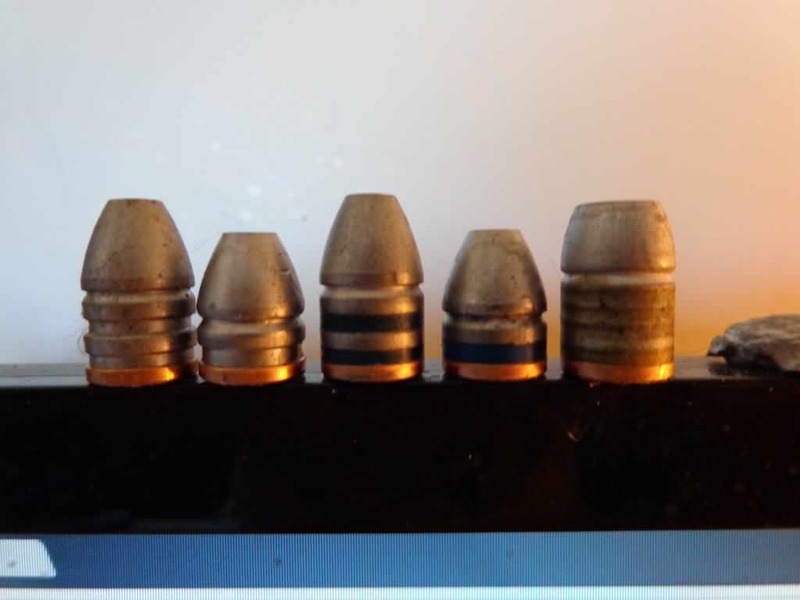 Bullets printed clean holes at 100 yards.